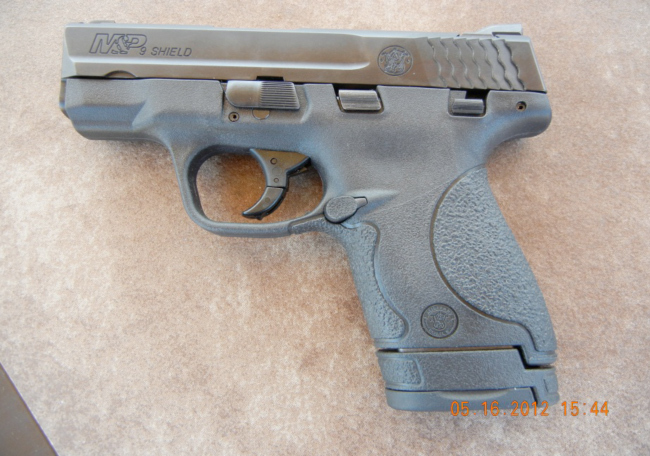 The Smith and Wesson M&P Shield is the newest small handgun on the market for carry and concealment. I bought this nasty little bugger yesterday at a local pawn shop brand new. It was the last one for sale that I could find in the entire area, and from what I have been told, they are not accepting any new orders. They are apparently backordered as it is, so if you want one and see one, go get it! My initial impression of this gun after purchase was "Holy Cow it's small and comfortable!". This gun felt right at my side. (For the little time that it spent there) The shield is light weight, compact, and easy going on the hip or wherever you may choose to carry. The price tag also gave me a good feeling with just a humble $450 bucks brand new so it doesn't break the bank! 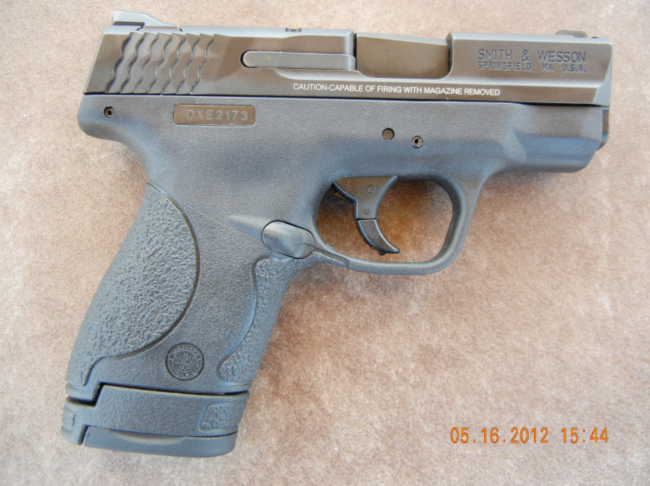 The Shield 9mm features a polymer frame, metal slide and standard (non-glow) rear and front adjustable sight. Included is a 7 and 8 capacity single stack magazine. As I said before, the gun is very small and slim, to achieve this, the double stack had to be cut from the mix. Also new to the table, at least for me are two different capacity magazines. One has an extended grip which allows a 8th round. The other does not have the grip making concealment easier and offers only 7 rounds. In an accurate handgun, 7 is plenty to stop a threat. So after a sleepless night I woke up excited to start the day today. I grabbed my Shield, a few other guns and drove to the range eager to test this thing out. I brought with me 150 rounds of 9mm 115 grain Monarch brass ammo from the local Academy. Upon getting to the range and prepping to fire I noticed how light it still felt even fully loaded. As I began to fire, my usual pattern didn't happen and got me slightly worried. It was still hitting in the general area of where my shots normally land but not quite as tight. I brushed this off as being a brand new gun and my being new to firing this type of pistol. (I am a full sized handgun kind of guy). Initial shots after the first two magazines lead me to believe this gun not only performs exceptionally at the 7 yard line but also has more than manageable recoil. I never once thought about the rise of the gun, I just wanted to shoot more. It was kind of like buying your first brand new car and you want to keep driving it but realize eventually you have to fill up your tank. I lost count of rounds quickly until I got to the point of having to reload. Once I had fired from the 7 yard line I moved back to about the 15 yard line (About that, was trying to measure from the metal targets which I know is close to 20 but those targets also sit farther back.). I fired one handed as I do with my 45 and was landing considerably awesome shots for someone like me with a small gun that I am still getting used to. I ended up with one small section of the paper littered with 9mm holes that were nice and consistent, just as they were from the 7 yard line. No jams, no failure to feed, nothing (Except the duds in the box of ammo, but I won't buy the brand again). I took to the metal targets that are about 20 yards out and managed to hit them a few times. I continued to find myself amazed at how I could land shots on something so small that was that far away. I think the comfortable ergonomics with the outstanding craftsmanship of the Shield makes for an exceptional combination. So, after everything was said and done I put all 150 rounds through the gun with no problems on the guns part. 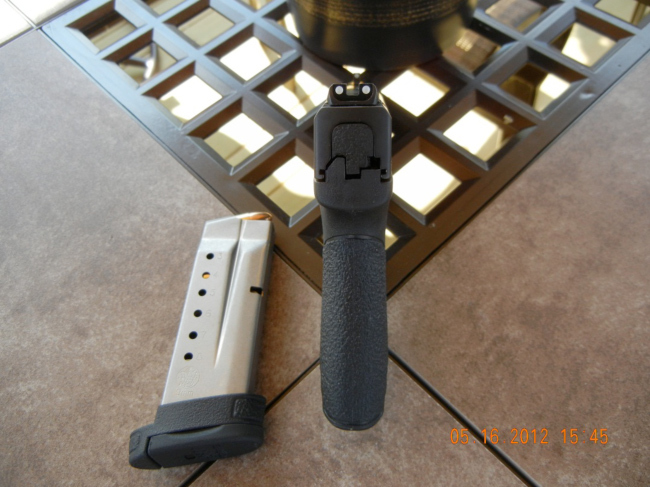 The spring used for the slide is exceptional and handles recoil really well. The trigger pull is not a mile long but does take some getting used to, at least for me as I am a 1911 guy and haven't fired a gun with that kind of trigger in quite some time. I got great groupings at both the 7 and 15ish yard line both single and double handed. Nothing about this gun feels wrong ,and I in a time of crisis I could rely on this to defend myself. I don't have a holster for something this small and probably will get one eventually but for now it feels like it is a part of my hip with my belt holding it in place. I think that for anyone getting into a concealed carry lifestyle this is the way to go if you can find one. For those that want home defense pistols, this is also the way to go as it is easily hidden and has great safety features so the little critters running around your house don't get hurt if they do somehow manage to find it. I love this 9mm and I can't wait to get my hands on the .40 to see how much of a difference there is between the two. 40 caliber has always been a little stout in small guns but if this 9mm is any indication on how this gun will recoil with a .40, I can say that I will be pleased and honored to own both. So in the end, the Shield is affordable with cheap ammo as well as comfortable, reliable, and has a pretty darn consistent shot group. Welcome to the new carry! what are your thoughts on the m&p shield?